I am being installed in Saint Mary’s Cathedral, Limerick, tomorrow afternoon [19 February 2017] as the precentor in the the joint chapter of the three cathedrals in the United Dioceses of Limerick and Killaloe: Saint Mary’s, Limerick, Saint Flannan’s, Killaloe, Co Clare, and Saint Brendan’s, Clonfert, Co Galway. Saint Mary’s Cathedral was founded in 1168, and is preparing to mark its 850th anniversary next year (2018). It is the oldest building in Limerick that is in daily use. and has the only complete set of carved misericords left in Ireland. These misericords are probably the best-know features in Saint Mary’s and were once in the choir. They are unique in Ireland and are the only surviving pre-Elizabethan carvings. They probably date from 1480-1500, perhaps from the restoration work carried out by the last pre-Reformation Bishop of Limerick, John Folan (1489-1522). The wood used in carving the misericords is said to have come Cratloe, Co Clare, which was the source too for the oak beams in the roof of Westminster Hall. Of the 21 carvings, 16 are different, with mediaeval emblems such as a two-legged one-horned goat, a griffin, a sphinx, a wild boar, an angel, a head resembling Henry IV, a dragon biting its tail, antelopes with inter-twined necks, a swan, an eagle, the Lion of Judah with a dragon, as well as a human head wearing a ‘chaperon’ under the stall reserved for the Dean, and a cockatrice or two-headed lizard holding its tail for the Archdeacon of Limerick. I must go in search tomorrow to find out whether there is a wyvern or two-legged dragon biting its tail under the stall for the Canon-Precentor or a griffin (half-eagle, half-lion) carved by the master's account – the two are described in different accounts of the stalls. There is another wyvern for the Canon-Chancellor, but the seat for the Canon-Treasurer is broken. The chapter once consisted of the Dean, Precentor, Chancellor, Treasurer, Archdeacon, and the 11 prebendaries of Saint Munchin, Donoghmore, Ballycahane, Kilpeacon, Tullabracky, Killeedy, Dysert, Ardcanny, Croagh, Athnett or Anhid, and Effin. At some point, probably in the 19th century, the choir stalls with their misericords were removed from the main body to the cathedral, and were stored in the crypt. Thankfully, they now see the light of day in the north transept. Some of these carvings may have inspired some other images around the cathedral. As I strolled around the churchyard last weekend, I noticed the vault, dating from 1753, that is reserved for the Sexton family, descendants of Edmund Sexten (1486-1555), Tudor merchant and Mayor of Limerick (1535), and a friend and confidant of King Henry VIII. The vault is decorated with ornate carvings depicting the Hydra, the monster who guarded the entrance to the underworld in Greek and Roman mythology and symbolising the conflicts of life, and a pelican feeding her young with blood from her breast, symbolic of Christ’s sacrifice. Both also symbolise new life and resurrection, for the pelican's young survived her death, and the Hydra sprouted seven new heads for each head that was chopped off, until it was slain by Hercules. The Sexton family interests were inherited by the Pery family, Earls of Limerick, who still claim yet another stall in Limerick Cathedral as Priors of Limerick. This stall now stands at the west end of the cathedral, on the north side of the Great West Door. ]Tomorrow (Sunday) … ] At 5pm in St Mary’s Cathedral, Limerick, the Revd Professor Patrick Comerford will be installed as the Precentor in the joint chapters of St Mary’s Cathedral, Limerick; St Flannan’s Cathedral, Killaloe; and St Brendan’s Cathedral, Clonfert. Canon Comerford is currently Priest–in–Charge of the Rathkeale and Kilnaughtin Group of Parishes, Lecturer in Anglicanism, Liturgy and Church History in the Church of Ireland Theological Institute, and prospective Director of Continuing Education in Limerick and Killaloe. At the same service, a new Diocesan Guild of Readers will be inaugurated. The preacher is the Bishop of Tuam, the Right Revd Patrick Rooke. Walking around Saint Mary’s Cathedral, Limerick, and the adjoining churchyard last week, I noticed a blind arcade of Tuscan arches and columns, and wondered what they were and what building had they once graced. I followed the cathedral boundary walls and railings around Bridge Street and Nicholas Street to find all that remains of the former 17th century Limerick City Exchange. The Exchange was first built in 1673, close to Saint Mary’s Cathedral, to house the city’s covered market and council chamber. It was built at the expense of William Yorke, Mayor of Limerick, who gave it to the city corporation. This Exchange Was Rebuilt At Expense Of The Corporation Of Limerick The First Year Of The Reign Of Queen Anne Anno Dom 1702 William Davis Esquire Mayor Rawley Colroys Robert Wilkinson Sheriffs. A new Exchange was built by the Limerick architect Henry Denmead (1744-1788) in 1777-1778 at a cost of £1,500. The new foundation stone was laid on 25 June 1777, and Denmead’s ‘re-edification’ was carried out in hewn stone front, with seven Tuscan columns and balustrade and a new council chamber. The council chamber was 40 ft in length, 30 in breadth and fift15een feet high, finished in the Ionic order. The Limerick-based architect, James Pain (1779-1877), whose other works include Castletown Church and the former Rectory at Askeaton, was paid £432.17s 5d for repairs and alterations to the Exchange in April 1815. 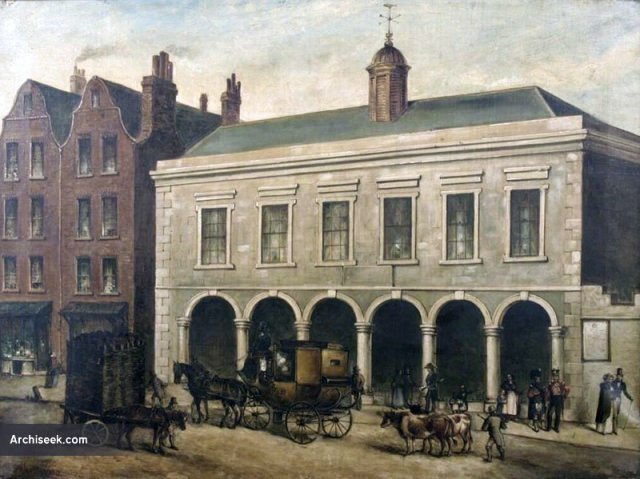 His brother, George Richard Pain, carried out additional repairs in June 1819 at a cost of £182.1s 2½ d.
The Exchange fell into disuse in the mid-19th century after a new town hall was built across the bridge in Rutland Street. The building was later used as an evening national school. The 1872 Ordnance Survey shows the building was in use as a national school, and the floor plan shows a single unified space opening onto Nicholas Street and three small secondary rooms to the rear. A passage or corridor to the west appears to have given access to the Cathedral churchyard, and the building to the rear looked onto the walled graveyard. A lane, now gone, called Grid Iron Lane, ran along the east side elevation of the building, returning at right angles to meet Bridge Street. All that remains of the Exchange now is a row of Tuscan columns in the boundary wall surrounding the churchyard of Saint Mary’s Cathedral, and the name of a local street, Exchange Street. The single-storey limestone exterior wall is clearly visible from the Nicholas Street side. This blind arcade of six arches is formed by seven half-engaged Tuscan columns standing on a limestone base, breaking to a centre arch and end bay to the west. In the space of the six arches between the columns, there are coursed rubble limestone in-fills. At either end is an ashlar limestone pier engaged with the end columns, giving a strength of composition to the broad intercolumniation. The area fell into progressive decline during the late 19th and early 20th centuries. Much of Nicholas Street was rebuilt in the mid-20th century following the mediaeval terrace plots of Englishtown.